This elegant necklace is made from real flowers hand-cast in sterling silver. There are fresh flowers that last a week and then there's this elegant necklace made from flowers that last a lifetime. Britta Ambauen hand-makes each charm by filing and burring petals, which are then cast in sterling silver. It's the perennial piece you need to take any ensemble from garden variety to one-of-a-kind. Choose up to four flowers. Handmade in Seattle, Washington. Britta Ambauen likes to infuse the ideas she contemplates most into her jewelry, and hopes her pieces will help remind others of their own thoughts and wishes. Utilizing a wide variety of materials and techniques, including wire wrapping, bezel setting, and etching, her eclectic accessories balance simplicity and intricacy, sophistication and youthfulness. Much of Britta's work is inspired by the strong female figures in her life. Learn more in our interview with Britta on the blog. Gently rub the surface of the pendant and chain with a jewelry polishing cloth. 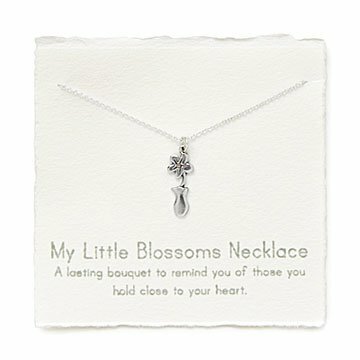 This necklace is the perfect Mother's Day gift....a bouquet with precious flowers symbolizing the children in your life. I purchased it for my daughter to honor the two children in her life: her twin daughters. The necklace is lovely and very delicate. I would highly recommend this item. What a beautiful way to thank my daughter for the 2 very precious grandchildren she has given me! I bought the necklace as a gift for my wife for her first grandchild.